[Zach] sent in his temperature controller and display for PS3, and even though it only works with a PS3 fat, we like our PS2 backwards compatibility very much, thank you. The build stated off with [Zach] putting thermal sensors on the CPU, the RSX, and Northbridge of his PS3. After starting out controlling the fan with his laptop, he moved on to an integrated fan and display controller after seeing this post about a ‘hidden display.’ In the end, one of the coolest looking PS3 mods we’ve ever seen was born. The build runs off an Arduino Pro that gets the temperatures from the sensors, prints everything to a custom 7-segment display board, and controls the fan. [Zach] thankfully made the Arduino source available and also put up some board files if you’d like to make your own. It’s a pretty impressive build that’s completely invisible when the PS3 is powered off. Voice recognition system controls everything, hopefully won’t kill us. The video they posted is pretty impressive. The automation system responds to voice and can control appliances, ‘throw a party’, and provide a user with their location. This is just the foundation of a system that can be built upon – developers can easily integrate a microphone and speaker into a device so it can connect to the system’s server. Apps, too, are pretty extensible – they’re registered on the server with meta tags that provide a wealth of data to be manipulated. It’s a very, very cool project that we really want to try out. 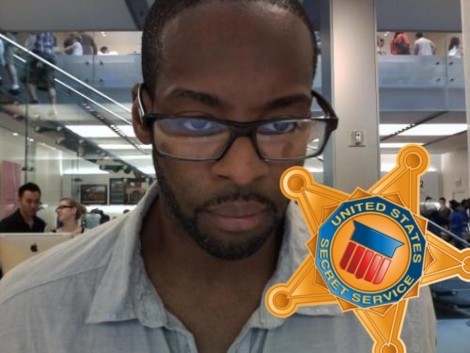 [Ko] wanted to add an extra monitor to his computer, but he wasn’t looking for something huge that would sit atop his desk – he desired something smaller, much smaller. His ChibiMo mini USB monitor is a neat little creation that lets you extend or mirror your Windows desktop onto a tiny 128×64 pixel LCD panel. At first glance you might think that it is too small to be useful, but it is recognized in Windows in the same fashion as any standard monitor. This means that it would be quite easy to load system monitoring software solely on the LCD panel, keeping the clutter off of your main display. 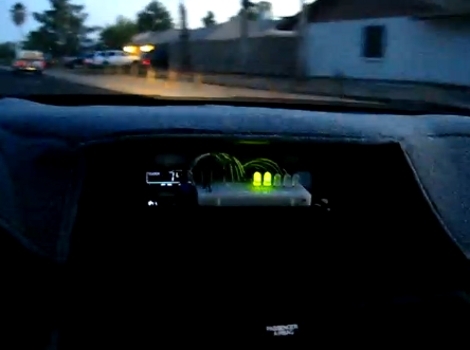 The display is wired to an Arduino like any other standard shield, and is connected to his computer via a USB cable. Once the ChibiMo sketch is uploaded to the Arduino, the display driver needs to be loaded on the PC. This allows you to tweak the ChibiMo’s display settings in Windows’ display manager. [PJ Allen] built a meter to display gravitation force in an easy to read way. Good thing it’s easy to read, because he’s added it to the dashboard of his car. That way he gets instant feedback when he puts the pedal to the metal. We’re hoping this encourages safe driving practices. But since it appears that not only is he watching the meter while he drives, he’s also holding a camera at the same time, we’d say this makes him a menace on the road. But we do like the hardware concept. He used five Red/Green LEDs to show what the accelerometer is sensing. 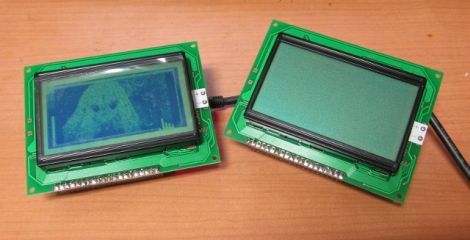 A green display reflects acceleration, while a red display shows deceleration. Inside the project box you’ll find a Parallax 2-axis accelerometer and an SX28 micrcontroller. This is an 8-bit Parallax chip family that was discontinued a few years back. A while ago when he was working in China, [Phillip Torrone] started learning Mandarin Chinese in order to help him communicate more efficiently with his peers. Unfortunately, once he returned to the US, he slowly started forgetting most of what he had learned. 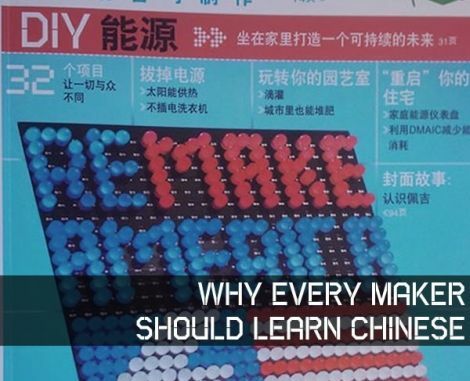 He recently wrote a piece over at Make: explaining why he’s attempting to learn Mandarin once again, and why you as a maker should consider doing the same. He starts off citing the economic trends which indicate that China’s global GDP share will likely bypass that of the US in a few short years. While the stats might be a bit boring he says, the rise of a new global superpower is nothing to shrug off. Economic changes aside, he has found that through his workings at Adafruit and other tech companies, he is frequently being exposed to more and more Chinese on a daily basis. Between emails with suppliers, data sheets, and schematics, he says that learning Chinese is a must for makers. What do you think? Do any of you full-time makers and hackers see the same trend in your jobs? Let us know in the comments. 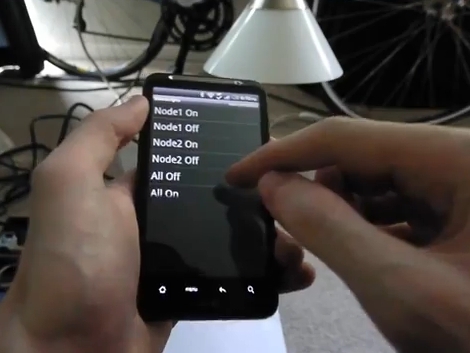 Here’s a way to gain control of your projects using an Android device. Bluescripts is a free app available in the Android market that makes it a bit easier to make interfaces to send customizable messages. If you have a Bluetooth receiver in your project, connecting to it is as easy as putting the MAC address into an XML file on the Android device. Each tag in that file has a name, as well as the address of the target and the message that should be sent. On the receiving end, you just need to make sure your project hardware is ready to receive an ASCII message and act based on what comes through. Check out the demonstration video after the break. Perhaps it’s not as cool as you could do if you were writing your own Android program, but we can’t think of anything we’ve seen that makes an Android interface this quick and easy.